Cavitation found application in ultrasonic cleaning baths. It has sufficient force to overcome the adhesive force between molecules of impurity and clean surface. Controlled cavitation phenomenon can be used to enhance a chemical reaction. Cavitation process uses to homogenize and mix the suspended particles in colloidal liquids. Cavitation used to improve the performance of high-speed marine vessels and projectiles. Cavitation in wastewater treatment - extreme cavitation use to break down pollutants and organic molecules. 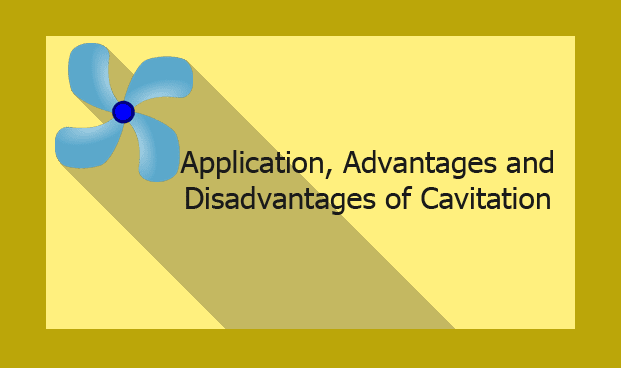 The field of material processing technologies and medicine use the advantages of cavitation. In shock wave lithotripsy, cavitation plays major roles in the destruction of kidney stones. Cavitation also used in other medical treatments (eg: Liposuction), where ultrasound is used. Shockwave produced by collapsing of bubble cause significant damage in moving parts of hydraulic machines. Cavitation causes vibration and noise. Cyclic stress on boundary surface cause the fatigue of material. Localized cavitation causes stress erosion of metallic surfaces and produce cavities in it. The shock wave produced by cavitation is the one of the problems of military submarines, it exposes the position of submarine. Cavitation in pumps, turbine and other hydraulic machines restricts the flow of fluid and reduce the efficiency.